Do you ever have an idea for a project that just sounds so perfect while you are planning it? Then you have gathered your thoughts, supplies and are in the middle of the project and it doesn’t work … it literally falls apart? This has happened more than once to me. So, you move on to ‘plan B’ and it works … yeah! Now another problem … what do you do with the leftover stuff that you didn’t use? 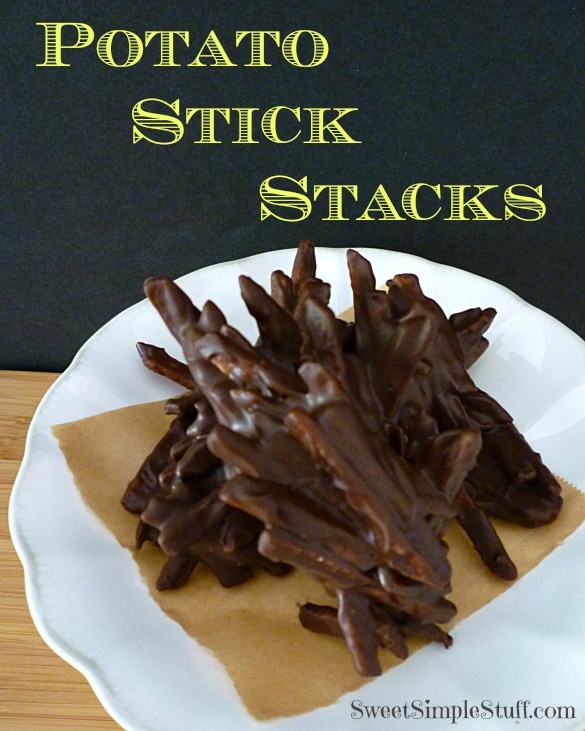 I’ll tell you what to do … make Potato Stick Stacks … of course! 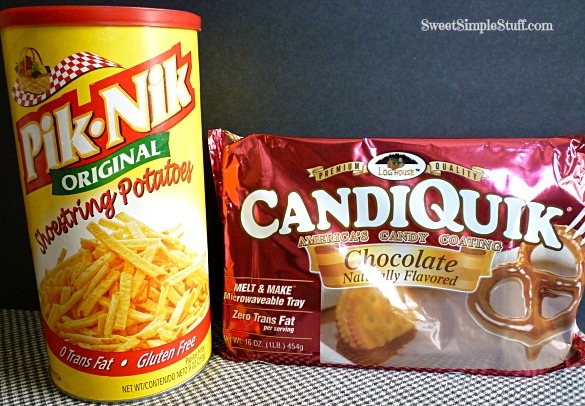 Would you like some chocolate covered potato chips? You know you do! Do you want to stand in the kitchen all day dipping one potato chip at a time? I don’t! I have an easy peasy, super simple solution … clusters! I found it easiest to work in smaller batches. Pour about 1 cup of melted chocolate in a medium bowl, add about 1-1/2 cup potatoes, stir until potatoes are coated in chocolate, add more if you like. Drop spoonfuls of mixture on prepared tray. Chill for a few minutes. Repeat until all chocolate is used. Now, tell me … was that the easiest thing ever? * Thank you once again to Sarah (Miss CandiQuik) for supplying the chocolate! I thought you were going to say you eat the mistakes (cuz that’s what we do), but no…..you make something else which is probably better than the original idea. 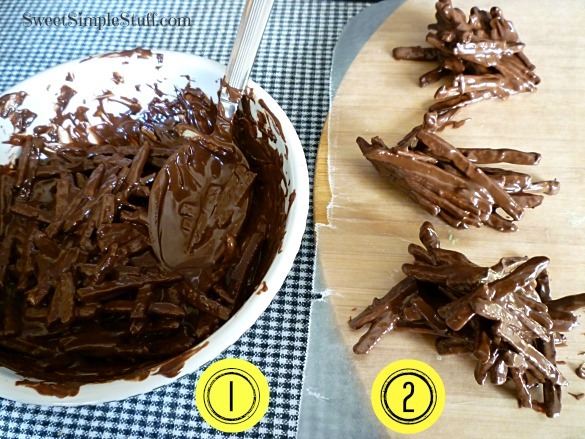 Oh yes…..have stood for hours making chocolate potato chips, only to see kids snarfle them down in seconds. This is MUCH simpler and probably just as good. It sounds like the way to go! Will put this on my Halloweeen list. I was so excited about the sticks that I forgot to mention…..for Halloween you could sprinkle a FEW Halloween related sprinkles on top while the stack is still wet. We do like these more than the potato chip version, because of the thickness of the sticks … more crunch! Sprinkles would be a great addition … how about candy eyeballs? For the non eyeball ones, which I think is the best idea, you could sprinkle a few p.b. 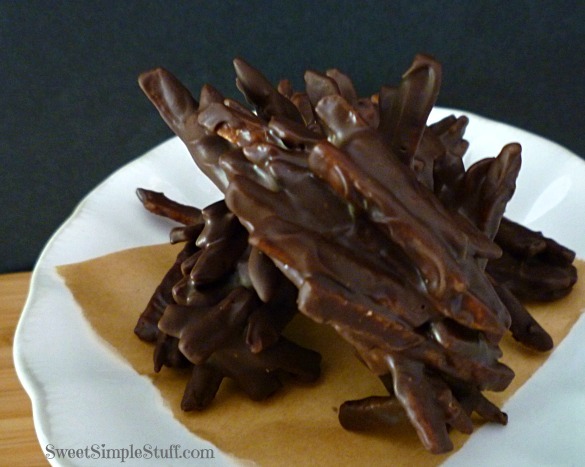 chips on the stack while chocolate still wet. They look awesome. I will have to show this to my daughter & have her make it for us. Thank you Anna 😉 You are so lucky to have a daughter that will make treats for you! Yes, please! LOVE chocolate dipped ‘taters. I’ve never used these shoestring ones though – they’re cute! Oh, I’ve had my share of mishaps when creating edible crafts and it’s always great when you can make some that tastes great even if an idea falls apart! Not sure if anyone is posting, but I have made them for years using chocolate chips/different flavors and sometimes sprinkling them. We cool them in the fridge on wax paper in layers. They are our favorites!! Thanks for posting. I was looking to see if there were other ways to make them.